The protagonist of these two volumes is Albert Anderson, one of the “impure” humans. Aside from being a potential target of the shoot-on-sight Topsiders, Al has joined the population of the anthropomorphized Endtown because his girlfriend, Gustine Greene, has become a 700-pound anthro rhinoceros. In ‘A Fistful of Beans’, Al is sent Topside to search for food in the ruins of human cities, since Endtown is not self-supporting. After barely evading a Topsider squad and a monster, Al returns to Endtown loaded with canned beans – and is almost lynched by the Endtowners because they are sick of canned beans! Al is rescued by Endtown’s mad-scientist/leader, Professor N. X. Mallard, a duck. In the more serious ‘Gustine’s Quest’, Al’s girlfriend is pathetically anxious to be cured of her mutation. When she is told that the fruit of a mysterious plant in far-off Hillside may change her back, she is determined to go there, with Al along to protect her. 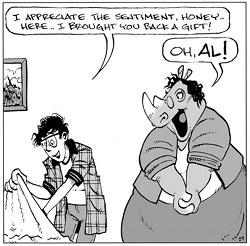 The human man and anthro rhino woman have many adventures, and Al is almost killed. Other prominent morphs in Endtown are Prof. Mallard; Mayor Walter Trimble (bear) and his secretary, Dottie Proctor (guinea pig? ); Jacob Jackrabbit, a pro-“mutanity” fanatic who is the leader of the movement to get everyone to adopt a last name based on what they have become; Captain Philomena “Blackie” Flask, the paranoid cat-woman who is head of Endtown’s Security and who is sure that the human-looking Al is a spy for the Topsiders (Neathery has said that his “Blackie” Flask is inspired by Dr. Marc “Blackie” DuQuesne, the ruthless villain of E. E. Smith’s classic “Skylark” s-f novels); Bill Crawford (horse) and Mike Mole, two scientists; and the multitudinous rat police. Petey, the self-aware and sarcastic truck, is also anthro enough for most fans. 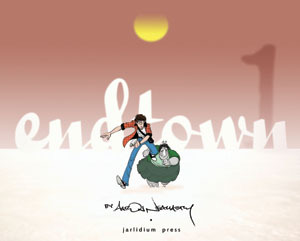 Aaron Neathery began posting Endtown on the Modern Tales website. When he moved to GoComics at the beginning of 2011, he started a new story-arc featuring new characters, principally the cat-man Wally Wallechinsky and his mouse girlfriend, Holly Hollister. (Endtown briefly appeared on both websites simultaneously.) Volume 3, when it appears, will feature ‘The Ballad of Holly and Wally’. The fourth story-arc, ‘Countdown’, is still being serialized on GoComics. Jarlidium Press’ two volumes are sharply printed on pure white paper so glossy that it practically squirts out of your fingers; three strips per page. As is usual with webcomics, the complete archive of Endtown is also available on the website; but it is so much handier to have it on paper that you can carry around with you! 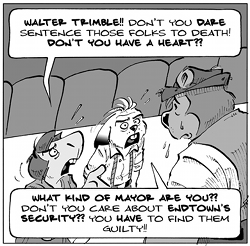 You should certainly be reading Endtown, and with these books you do not have to keep returning to the website archives’ table of contents to click on the next week’s worth of strips. "Endtown 1", by Aaron Neathery. Foreword by Shaenon K. Garrity. Jarlidium Press, June 2012, trade paperback $12 (unpaged [96 pages]). Available at Amazon, Rabbit Valley and Second Ed. "Endtown 2", by Aaron Neathery. Foreword by Jenner. Jarlidium Press, June 2012, trade paperback $12 (unpaged [98 pages]). I can't wait to read it. Thanks for reviewing it Fred! We are still working through the process with Amazon. The pages are up, but now the books have to reach their warehouse and be processed into the system. Meanwhile, both Rabbit Valley and Second Ed have the books in stock and available! Looking forward to new volumes coming out, I kinda prefer the storyline post book-2. 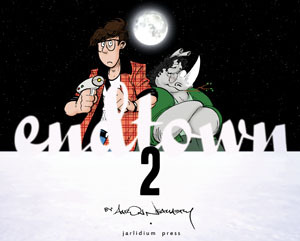 The biggest strength of Endtown is in how it juggles cartoon comedy and sci-fi drama. You can have a goofy self-aware raygun being a villain, and murder a few pages later. And it works. If these were censors, they wouldn't allow. Thankfully, there are none. I suspect GoComics is in fact censored. In the recent story arc, the artist has at several points avoided graphic depictions of major injury. This may be due to their own tastes, but it may also be because you cannot show such things next to certain advertising, for example.